The aim of this article is to describe the principles of local anesthesia for pacemaker implantation in the pectoral region. Practical methods will be presented during each step in subsequent sections. Even though sedation is available, the operator should develop and master the technique of local anaesthesia as one may occasionally come across a patient where sedation is not feasible or safe. Local anesthetics act by blocking voltage gated sodium channels on the neuronal membranes. Onset and duration of action differs among various agents and toxicity from systemic absorption also varies. For all practical purposes, lignocaine is the preferred local anesthetic – it has rapid onset of action, good safety profile and provides adequate time coverage for the procedure. Bupivacaine also can be used but caution is necessary if large amounts are used as systemic absorption may cause cardiac toxicity (but as electrophysioloigsts we should be able to manage these toxicities!). Furthermore bupivacaine has a long time of duration for onset of anesthesia. The principle advantage of bupivacaine is its long duration of action which extends well into the post operative period. However post operative pain is not a major issue in pacemaker implantation and the role of extended duration of bupivacaine must be balanced with toxic effects when large doses are used. 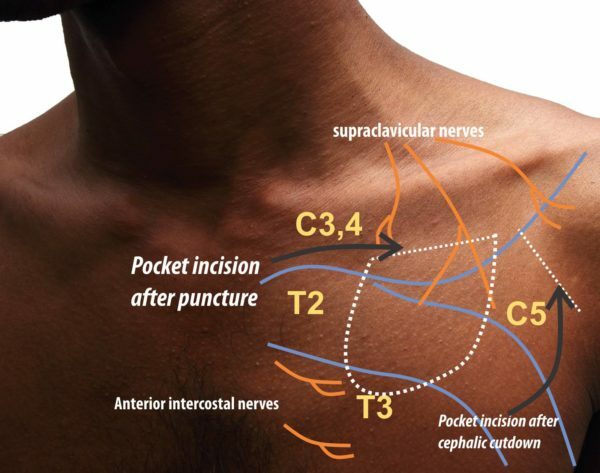 When post operative regional anesthesia is desired – for example in an apprehensive patient or when the device is large (ICD) – supplementary bupivacaine injection to the wound edges and lateral margins of the pocket is a useful approach while having completed the procedure with lignocaine. Local anesthesia should be used when the patient is undergoing implantation under general anesthesia as this permits lower levels of GA medications and facilitates smooth recovery and most importantly provides post operative pain relief – which may be a significant issue in children. The decision to use Lignocaine mixed with adrenalin as a vasoconstrictor agent is at the operator’s discretion although it does provide grounds for using larger doses of lignocaine. Some operators prefer not to use adrenalin as vasoconstriction may temporarily mask bleeders that may open up later inside the pocket – especially on patients who are on antiplatelets. The best weapon against bleeding is meticulous surgical technique (careful tissue dissection, hemostasis with diathermy/ligatures) – not to use lignocaine with adrenalin and hoping for the best. Lignocaine usually comes alone or pre-mixed with adrenalin at a concentration of 1:100,000. Standard plain lignocaine concentration is 2 % (20 mg / mL) and for a 60 kg patient, theoretical maximum volume of lignocaine to be drawn from the bottle is 13.5 ml – however this volume is grossly inadequate for pacemaker implantation and therefore we dilute the solution to 1: 2 or 1: 3 with normal saline (not distilled water as it entails injecting hypotonic solution to the tissues which may lead to tissue necrosis). (A final concentration of 0.7 – 1. 0 % is adequate for local anesthesia). If adrenaline mixed lignocaine is used, larger volumes or repeated injections in prolonged procedures can be done. Lignocaine injection per – se causes stinging sensation in the area and this can be minimized by gentle injection and pre-warming of the solution. If warming is not practical, at least ensure that it’s not cold from coming out of the storage cabinet or fridge. There are two basic requirements for successful local anaesthesia in cardiac pacing : Anaesthesisa to carry out the venous puncture and anaesthesia to make the pocket. provides a wide area of anesthesia to vary the puncture if the initial attempt fails. Video : Injection of local anaesthesia prior to puncture. This is given to a triangular area bounded by the clavicle as its base and the apex which is a point just distal to the future puncture site. The injections should be deep enough near the clavicular body to catch the supra-clavicular nerves. Slight massaging of the area helps to disperse the injection in to the subcutaneous spaces. A wide area of anaesthesia on the skin helps a difficult puncture by enabling the operator chose different entry sites as necessary. This is especially true for elderly patients, who may present with difficult puncture and ironically also cannot be sedated. Video : Injection of local anaesthesia after insertion of guide wire. A small amount of diluted (0.5%) solution is enough along the skin incision line – focusing the potential lateral and medial edges of the skin incision as the mid portion is already anaesthetized. More volume is necessary for the lateral and medial borders of the pocket. Mid portion of the pocket requires only a small amount of solution as the area is already anaesthetized. About 10 ml is kept for future use inside the pocket. The biggest benefit of getting used to this technique is that it makes your anaesthetic technique suitable for doing cases only with local anaesthesia without compromising patient comfort or safety. This is an invaluable skill to have when operating on elderly patients who will do badly with sedation.